I've been a bit busy TRAINING FOR A TRIATHLON. Yes, you heard right, it was a Sprint distance one (ie. half a proper Olympic distance) at Blenheim Palace on Sat 4th June - 750m swim, 20km bike and 5km run. I did the whole thing in 2hrs 24mins. 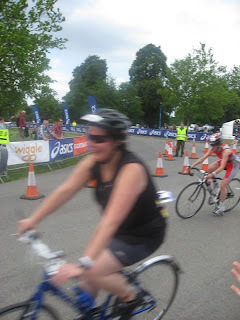 The swim in 19mins (11 mins quicker than my goal time), bike in 1hr 04 and the run in 50mins. I was determined not to walk any of it, despite a couple of the girls walking past me faster than I was managing to run. The bike was quite tough going as there was a big old hill in the middle of the the lap (3 laps). The main thing is I didn't finish last, by 158 people at the last count.